Outlander Ep. 110 – By the Pricking of My Thumbs – What are you reading? The latest episode of Outlander is all about the ladies, specifically, that little vixen Laoghaire (played by the wonderful Nell Hudson). She wants Jamie and boy, does she do her worst to get him. In last week’s mid-season premiere episode, it ended with Claire finding an ill wish under her marriage bed. Jamie was none too pleased and knew exactly who put it there. Fast forward to Episode 110 and Claire confronting Laoghaire in the kitchen about said ill wish. At first the young girl denied it, but then decided “what the hell?” Ms. MacKenzie confessed all and insulted Claire in the process, earning her a good smack in the face. Mrs. Fraser was sorry/not sorry for the smack, but warned Laoghaire to stay away. Okay! Claire comes across Geillis Duncan performing a Summoning ritual in the woods, which looks like the dance she and Frank watched before her fateful fall through the stones. Geillis, not one to be shy, confessed a few secrets to her friend (I won’t spoil them for you), which would make anyone else stay far away from Mrs. Duncan. Meanwhile, Jamie is doing what he can to have the price on his head removed. Ned Gowan offers to draw up a petition that could possibly have Captain Randall court-marshaled and Jamie free to return to Lallybroch, his family home. But the prissy Duke of Sandringham (played by Simon Callow) wants something in return before agreeing to take the petition to England. He talks Jamie into appearing as his second in a duel against a few members of Clan MacDonald, which ends up in unnecessary bloodshed. Claire, royally pissed, tends to her husband’s wound, but makes him pay in silence and a stitching needle. Thankfully, the Duke keeps his word and takes the petition. Things for Claire and Jamie go downhill after that. Colum exiles Dougal from Leoch and orders him back to his brother’s estate as punishment, sending Jamie with him sans Claire. 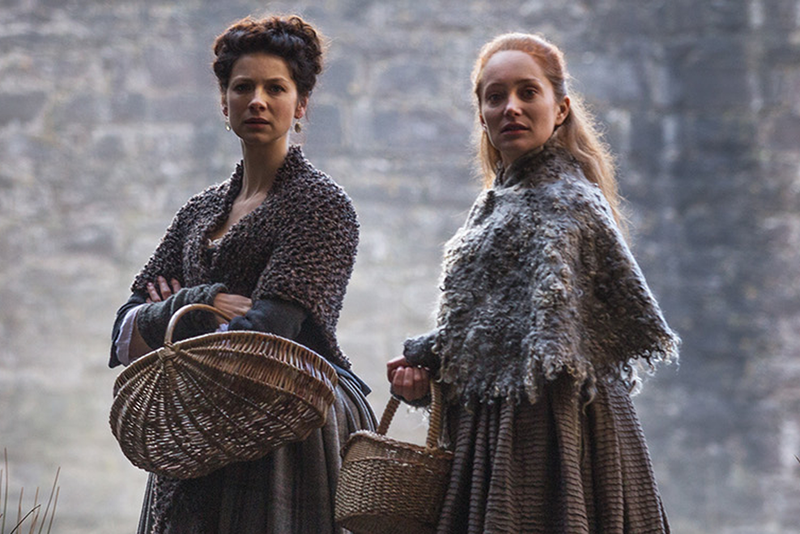 Jamie, not happy about leaving his feisty wife behind, warns her to stay away from Geillis. But of course, she doesn’t heed his warning because it’s Claire. She receives a note from said friend asking her to “Come quick,” and does just that. And since Claire never listens, she ends up getting arrested for witchcraft along with her buddy. As she’s being taken away to the Thieves’ Hole, Claire looks through the wagon bars just in time to see Laoghaire smirking at her! WHAT? That girl is a BOSS! What else does she have in store for Mrs. Fraser? Will Laoghaire finally get her hands on Jamie? Stay tuned. Outlander airs on Saturday at 9 p.m. on Starz.